Patients in Derbyshire who have been infected with C.difficile will be given cards to carry with them that will alert GPs and other health professionals to the risk of relapse. More than 300 people in the county were last year cnfirmed to be infected with the superbug, which affects the digestive system and is most commonly found in people who have been treated with antibiotics. Now staff at the Royal Derby Hospital and Chesterfield Royal Hospital, together with community health workers annd GP clinical commissioning groups, are distributing special cards, which can be handed to medical professionals to warn them against prescribing certain medicines. Dr Avi Bhatia, chairman of the NHS Erewash Clinical Commissioning Group, which is one of the organisations behind the cards, said: "We are taking no chances with C.difficile, even though infections have fallen sharply in recent years. That's why we've produced this handy card for patients to carry around and show to health professionals at the start of each appointment, ensuring that no medication is prescribed that might cause a relapse." Symptoms of a C.difficile infection can range from mild to severe and include diarrhoea, a high temperature or fever, and painful abdominal cramps. It can also lead to life-threatening complications, such as severe swelling of the bowel. 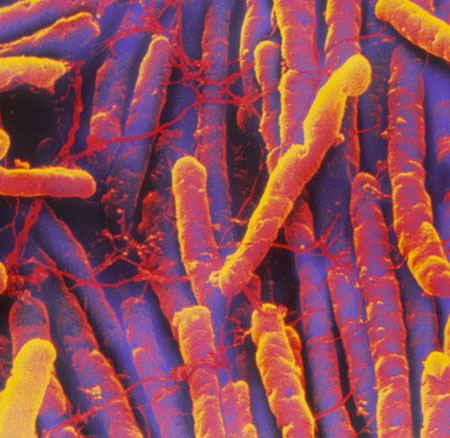 But health experts said mild cases of C.difficile can usually be controlled by stopping the antibiotic causing the infection, with more-serious cases treated with specific antibiotics. Symptoms should then improve in two to three days and clear up completely within seven to 10 days. Dr Sheila Newport, chairman of NHS Southern Derbyshire Clinical Commissioning Group – another group responsible for the initiative – said: "The majority of C.difficile cases occur in people who have had antibiotics. This may be in a healthcare setting, such as a hospital or care home, but can also occur at home without ever going to hospital." Nationally there were 14,687 reported cases in England from April 2012 to March 2013, compared with 52,988 in 2007. Organisations involved in the card system include Derby's hospitals; Derbyshire Community Health Services; mental health trust, Derbyshire Healthcare; and East Midlands Ambulance Service. They are working with NHS Southern Derbyshire, NHS Erewash, NHS Hardwick and NHS North Derbyshire Clinical Commissioning Groups – responsible for buying and overseeing local healthcare. These groups will be displaying posters and leaflets in hospitals and clinics across Derbyshire to make patients aware of the cards, and to encourage GPs to ask patients to produce theirs at the start of consultations.